Sharp’s Kissing Bridge spans a run along on U.S. 219. Photo courtesy Lisa Stansell Galintz. I travel Route 219 through West Virginia a lot — mostly through the southern part of the state, but on occasion I travel north. It seems my car knows the way, which leaves my mind space to watch the countryside and daydream a bit. Seriously, I have found myself wondering where exactly I am during a trip. In the spring and winter I scout the mountainsides for seasonal waterfalls. Just south of Union and the Indian Creek Covered Bridge there falls a lovely freshet that is surrounded by thousands of bluebells in the spring. It leaves me breathless and usually warrants a stop by the side of the road. On the way to Elkins from the Greenbrier Valley, about 25 minutes north of Marlinton, the towns of Slatyfork and Valley Head lie about 14 miles apart in the valley following the Big Spring Fork of Elk River. On the highway between, a few things are worth a slow down — if not a stop. At Slatyfork, Sharp’s Kissing Built was built in 2005 by Ken Gibson for his great uncle, Dave Sharp. 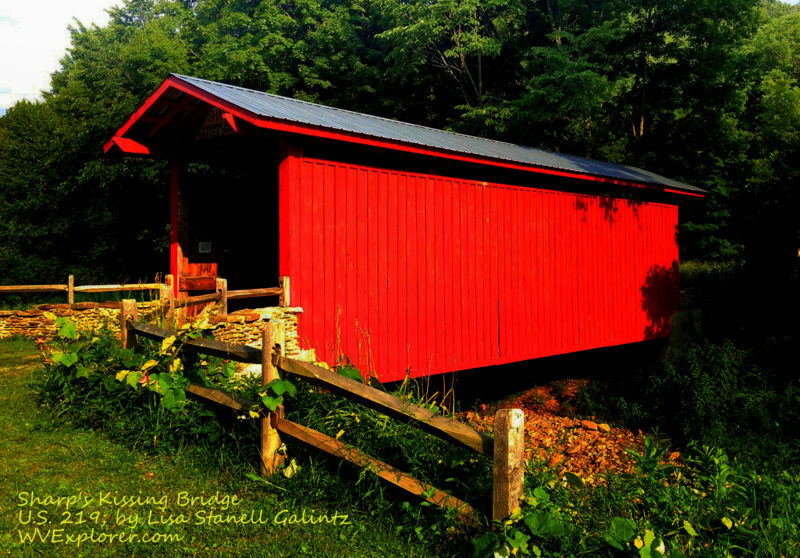 His uncle’s wish had been to one day own a red covered bridge, and he would regale listeners with memories of sneaking a kiss in an old covered bridge. 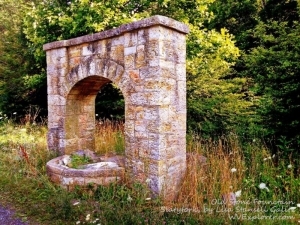 An old stone fountain near Slatyfork, WV, built by the WPA. Pull off the highway and park at the worked stone fountain erected by the Works Progress Administration, which employed millions of unskilled workers to carry out public works projects nationwide during the New Deal. The fountain was designed to provide drinking water to travelers and refill radiators of overheating cars. Remnants of these fountains can be found elsewhere along 219, and an almost identical stone fountain may be found to the south at, fittingly, Fountain Spring, near Peterstown. Another stone fountain was built at Valley Head, though not by the admisistration The fountain is built of dark stones and seems reminiscent of an older world. According to Will Fanning of The Brazenhead Inn, a bar operated near the fountain as well. Carolyn Swecker, who lived nearby, recounted an incident at the the fountain published in “He Saw Her Reflection First” — an oral history interview by the Traveling 219 Project. “Carolyn Swecker, George’s wife, tells us of a happier time — the moment when she and George met. It was at a wiener-roast held around The Old Stone Fountain. At that time, water still ran in the fountain and this kind of festivity for young people in the town was common. 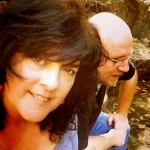 “We met at a wiener roast for my brother-in-law at the fountain. It was a beautiful park area with picnic tables, and the state used to have picnic tables on wide spots along Route 219. They had a pump there with water and swings for the children and everything, and they kept them mowed, and they were really nice. To find their fountain, drive north on Route 219 from Valley Head. About a half mile or so past the Brazenhead Inn you will see the fountain on your left. My thanks to i-treks and the Traveling 219 Project for help in solving the mysteries of the fountains. Previous articleIrish Bowling tourney brings record high-rated players to W.Va.